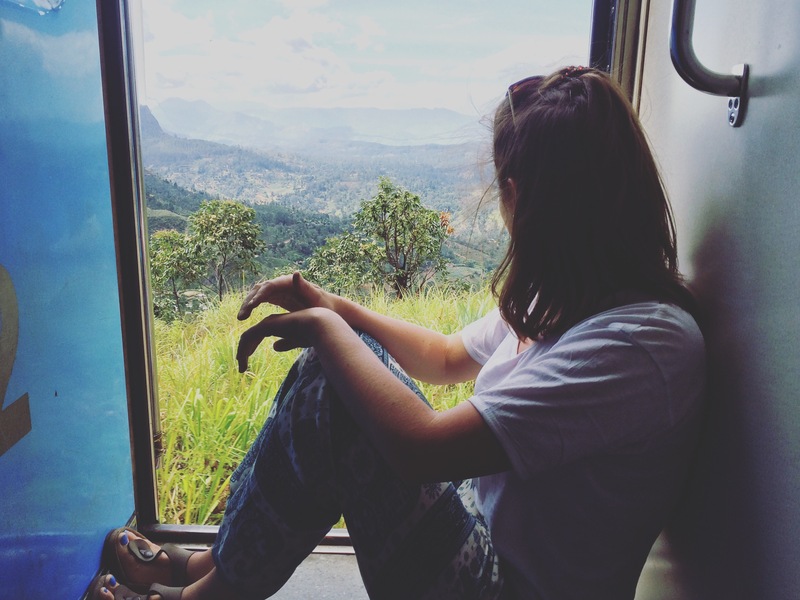 The train from Kandy to Ella was absolutely stunning. Sitting in the doorway means you get an uninterrupted view of the scenery. It took about 6 hours to get to Ella, but again the time passes so quickly when you have great company and great views. 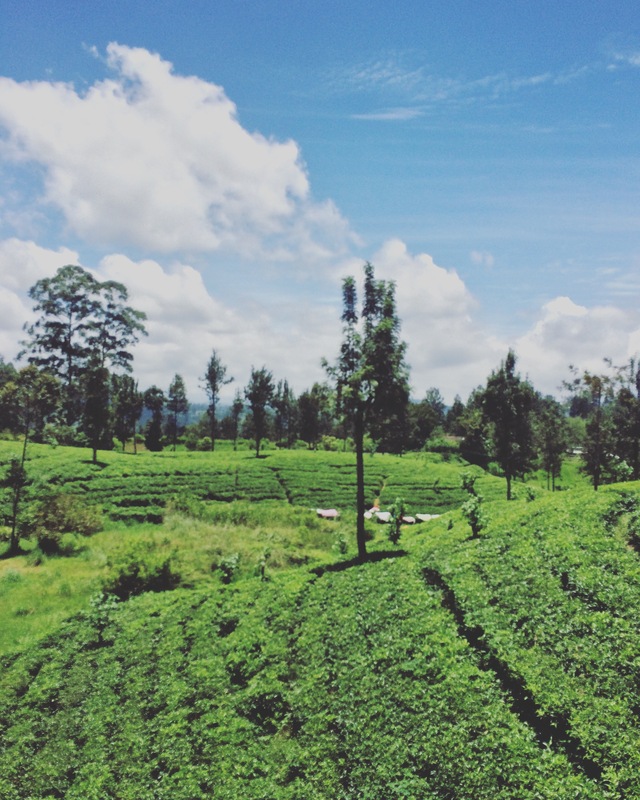 The train takes you through the hill country which is an area popular for growing tea. You can see the locals working in their tea plantations. The first impressions of Ella are good. 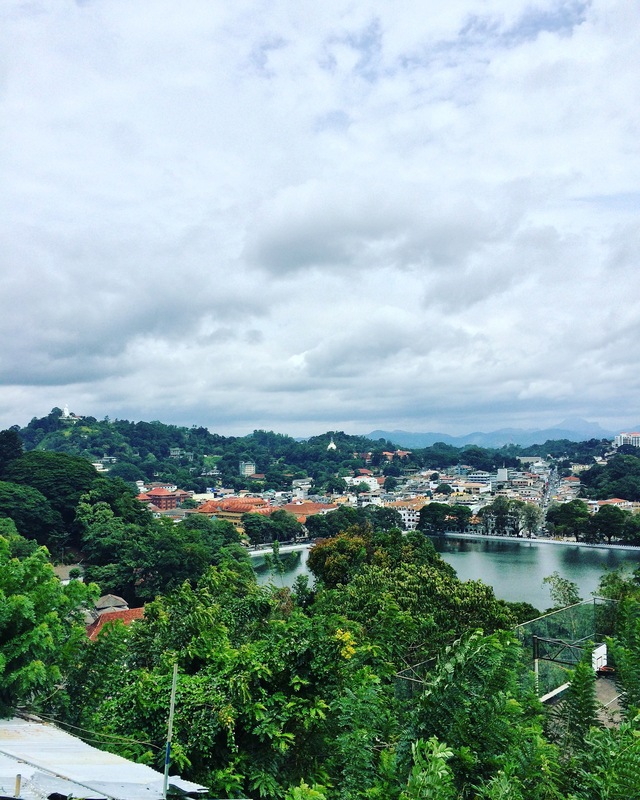 It is a tiny town compared to Kandy and Colombo and a lot more chilled out. 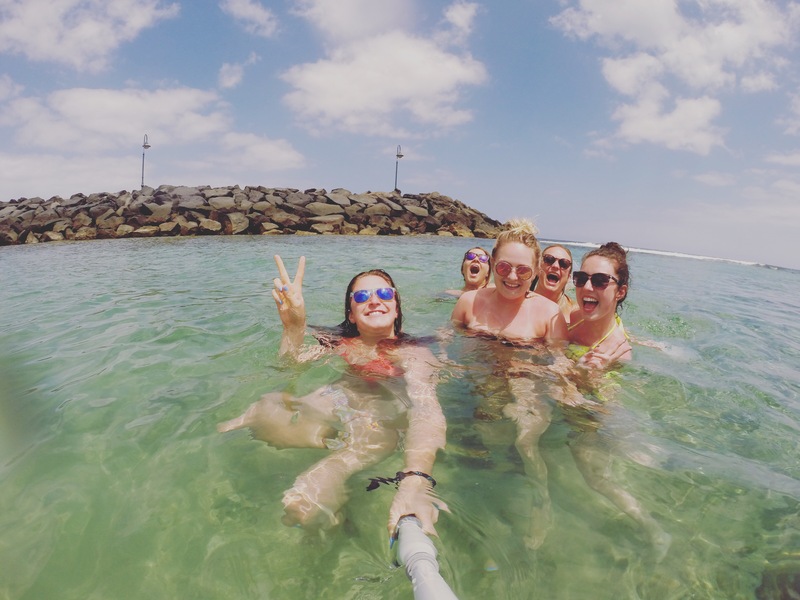 It is mainly for backpackers so there are a lot of hostels, guesthouses and places to eat. I was staying in a guesthouse called Samadhi Inn Guesthouse. 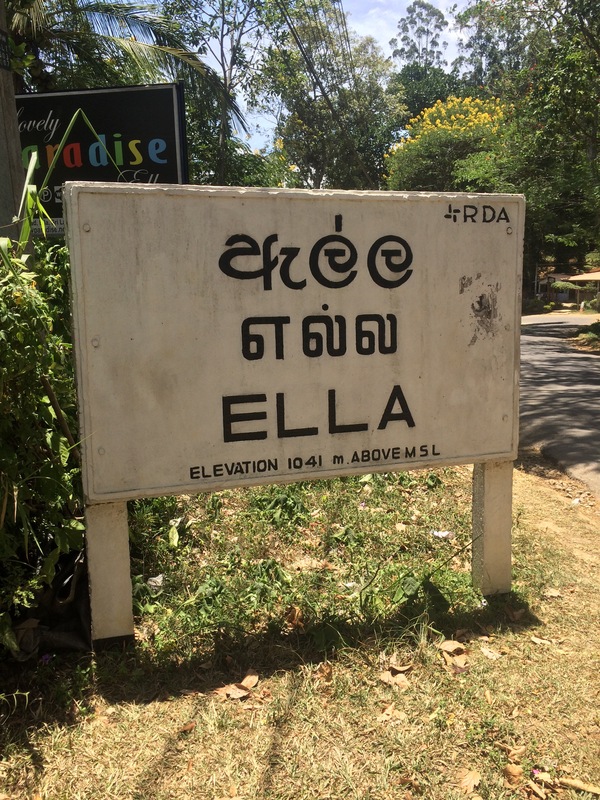 It is about 500m out of the main area of Ella but I would recommend staying there. The owners are so lovely and will give you a lot of tips on what to do whilst you are there. Nothing is too much trouble for them and they welcome you with a cup of tea. I don’t drink tea but thought this was probably the best place to have my first ever cup. 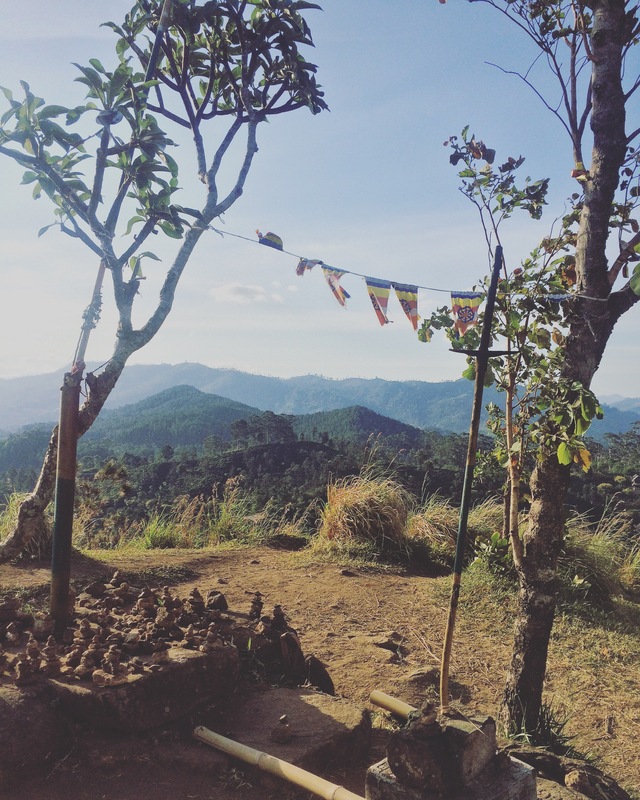 I met two girls from Austria and we headed out to walk up Little Adam’s Peak. It is a nice gentle walk, taking about 40 minutes to reach the summit. The path is clear but there are some bits where you could go one of two ways, so just ask somebody nearby. Just before the summit it gets extremely steep and you are challenged with more than 300 steps! This part was pretty exhausting but when you reach the summit and are greeted by a magnificent view of the surrounding hills you forget just how hard it was. From the top you are looking over the town of Ella and surrounding areas. That night we ate in a restaurant called Down Town Rotti House on the main street. I had been recommended by a friend from home to try some devilled chicken and when I saw it on the menu I decided to go for it. I didn’t know what to expect as ‘devilled’ makes me think of fire and that the food would be extremely spicy. In fact it was actually really quite mild, but with a great flavour. We sat on the rooftop terrace enjoying a couple of beers before heading back. 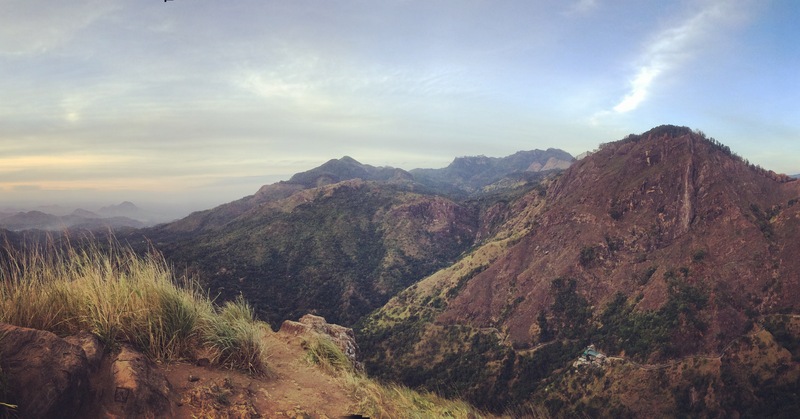 I woke early the next morning to climb Little Adam’s Peak again to watch the sunrise. Although I was on my own, there were other people around. I reached the summit and sat and waited for the beautiful sunrise to happen. Unfortunately there was not much action but the view was still incredible. I would recommend hiking earlier in the morning or later in the afternoon to try and avoid the unforgiving midday heat. Breakfast at the guesthouse is optional and costs 350 rupees (approx £1.80). For this small price you get toast, butter, jam, rotti, omelette (surprise chilli – beware! ), fresh fruit and tea. Nine Arch Bridge is further out of Ella and takes about 40 minutes to walk to. The path is not so easy and feels a lot more wild and overgrown. On arrival at the bridge I was told a train would soon be approaching. 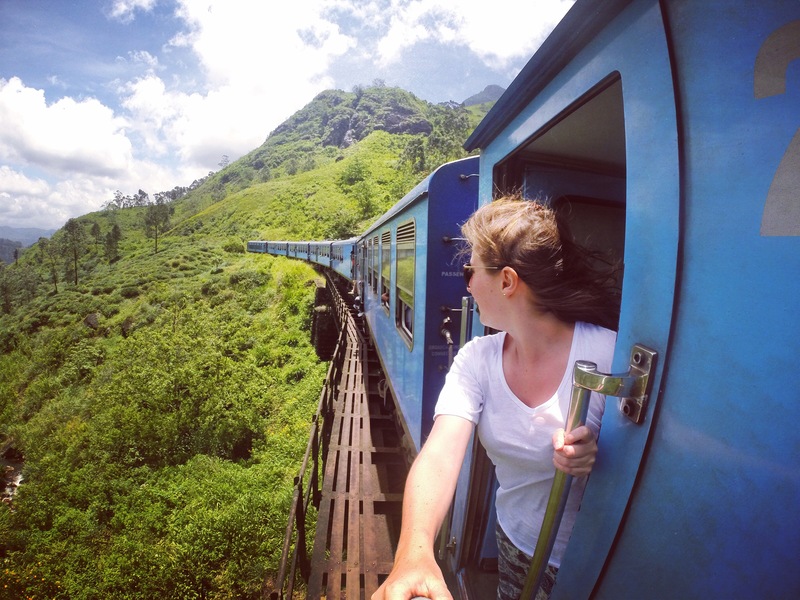 I have become a big fan of the trains since being in Sri Lanka so I found this very exciting and decided to hang around to watch it pass. I headed back to town and explored the town a little bit. There are some nicer shops here and it has such a lovely chilled out vibe. That night I ate in Ella Flower Garden. I ordered vegetable kotthu which is rice, vegetables and rotti all cut up and cooked together. My food arrived and unfortunately there was a power cut so I couldn’t really see what I was eating but it tasted great! The one thing I found surprising in Ella is how cold it gets at night. When I say cold, I was wearing trousers and a tshirt and I had goosebumps. So still a lot warmer than a Scottish summer! Ella is over 1,000m above sea level so I should have expected it really. 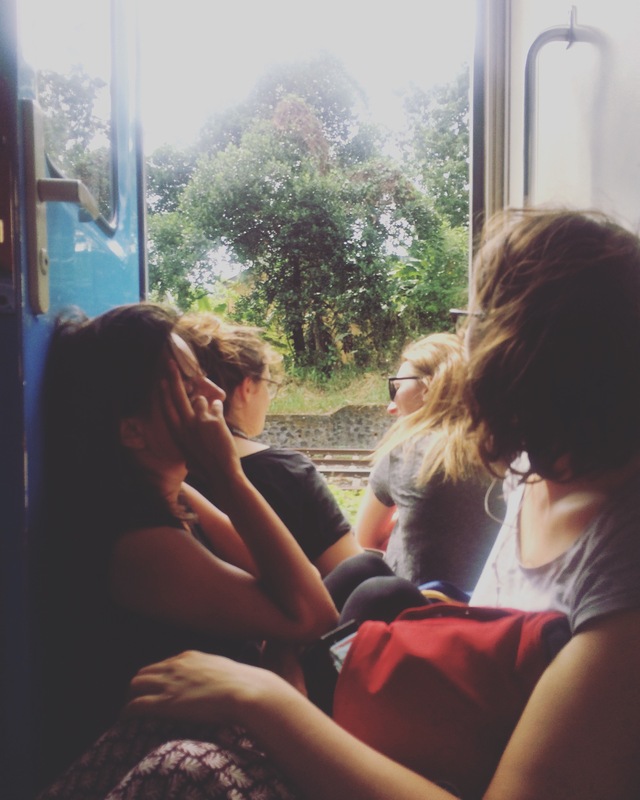 The next morning I headed back to the train station and booked my ticket for Colombo. This train would take approximately nine hours and the ticket only cost me 350 rupees. I was lucky to get a window seat to enjoy the view once more. If you can, try to sit on both sides of the train as the view from each side is totally different but both amazing in their own way. Top tip- if you are travelling on a budget, do not book train tickets in advance. Turn up to the station one hour before the train leaves and pick up an unreserved ticket. Unreserved means you are not guaranteed a seat but most times I have had no trouble. And as I said earlier, sitting in the doorway is actually a lot of fun. Just be prepared for a scrabble to get on the train as soon as it stops moving! 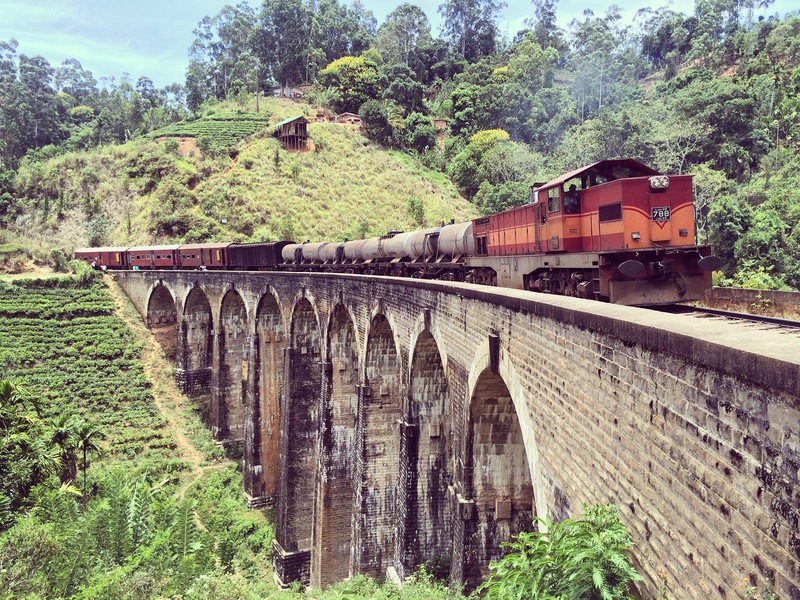 The train journey from Colombo Fort to Kandy takes approximately two and a half hours. The scenery is pretty good and sitting in the doorway with other backpackers chatting away makes the time pass very quickly. On arrival in Kandy I took a taxi to my new hostel, Kandy City Hostel. This is the sister hostel of Colombo City Hostel and booking through them gives you a 10% discount. Again the hostel is basic, but I felt it was nicer than the one in Colombo. There are two big social areas inside and a rooftop terrace which basically takes up the whole top floor. Melanie, the lady who runs the hostel is great and full of knowledge about Kandy. I set off on an adventure to see what I could find. 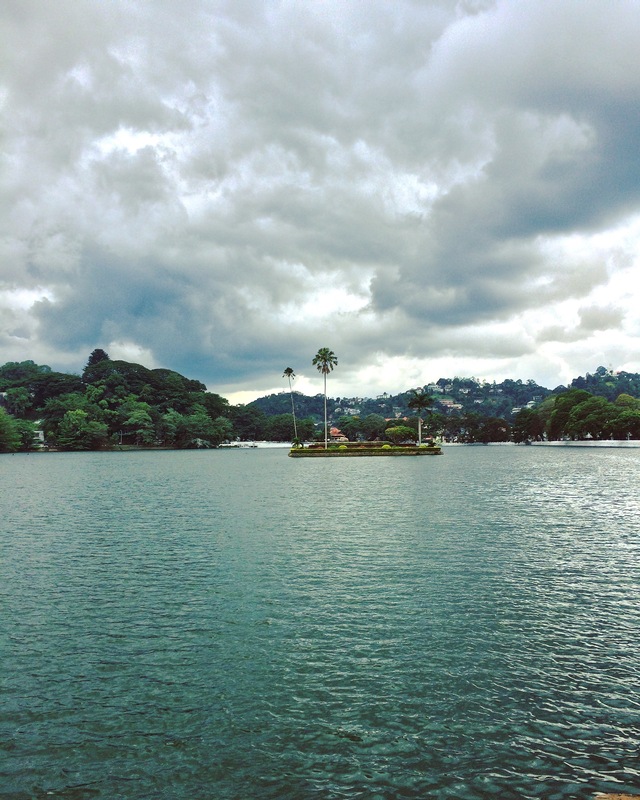 I walked around Kandy Lake which is filled with a lot of different wildlife. Unfortunately there were no turtles on display today, but there were a few huge iguanas (I’m talking about 6 feet long!). Going around the lake you will see a lot of local life with a few markets, people feeding the fish and those who are just out for a stroll. 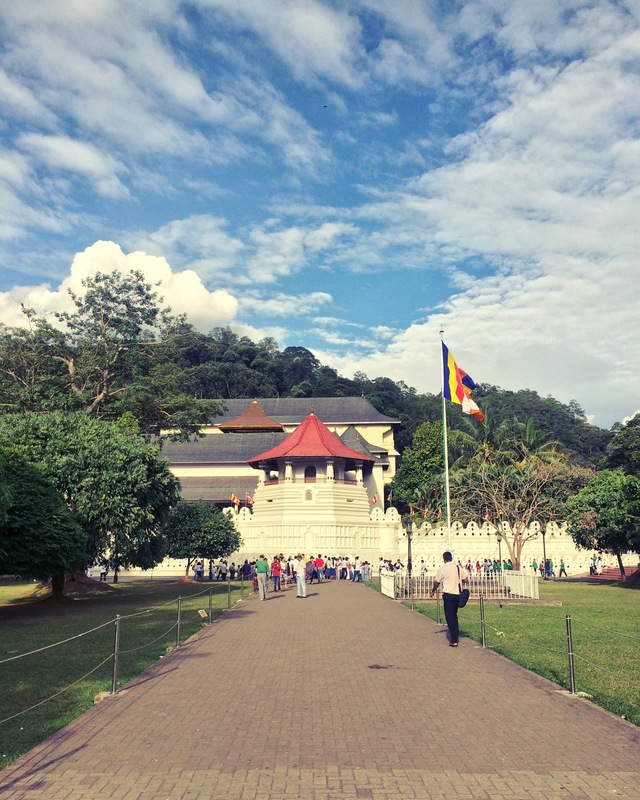 I then headed into the main area of Kandy where the streets are lined with stalls and small shops selling everything you could think of. It is a very busy place buzzing with activity. I found it very hard to get my bearings as there weren’t really any signposts and also no obvious landmarks to remember. Everything looks very similar, all the streets are lined with shops and the roads packed with scooters and tuk tuks, so trying to figure your way around is quite difficult. I didn’t find Kandy to be a very pretty town, but maybe I was looking in the wrong parts. Lunch was an interesting experience! There was a small cafe in the centre of the main market. The cafe was filled with locals so this was a good sign. I ordered vegetable curry and rice for 100 rupees (approx 50p). A huge plateful of rice and four different curries arrived. I had no idea what I was eating but it was full of flavour, only one out of the four being too spicy for me. After lunch we walked back to the lake and headed for the Temple of the Tooth. This is a Buddhist temple and they believe the relic of the tooth is from Buddha. It is quite a big temple complex, lots of little temples within the one temple. You could walk around for free and see quite a lot, but we decided to pay the 1,500 rupees (approx £8) and go into the main temple. The decor of the temple is beautiful, a lot of gold and elephant tusks. You can hire a tour guide to give you more information, but make sure you get a certified one rather than a local on the street claiming they are a guide. There are a couple of different ceremonies on at different times so try to tie your visit in with one of these. Jet lag started to set in and so after the temple I headed back to my hostel to chill out for a little bit. A couple of girls arrived in the dorm and we went out for some food. Melanie recommended a place called Bamboo Gardens so we decided to give it a go. We arrived to a lively rooftop restaurant and were greeted by very friendly staff. I decided to play it safe food wise and had vegetable noodles, but even this simple dish was delicious. The view from the restaurant is great and from there you can see the Big Buddha which is lit up at night time. The next day I walked from the hostel up to a view point called Arthur’s Seat. The walk took about 40 minutes. The view from the top was spectacular. From there you are looking over the lake, the Temple of the Tooth, Kandy town, and you can see for miles into the countryside. In the afternoon Sri Lanka were playing Australia in the final game of the cricket series. Even though I am not a cricket fan I decided to go along for the afternoon as I felt I had to experience it. Sri Lankans love their cricket! The streets were lined with cricket fans showing their supports with shirts, flags and decorated faces. 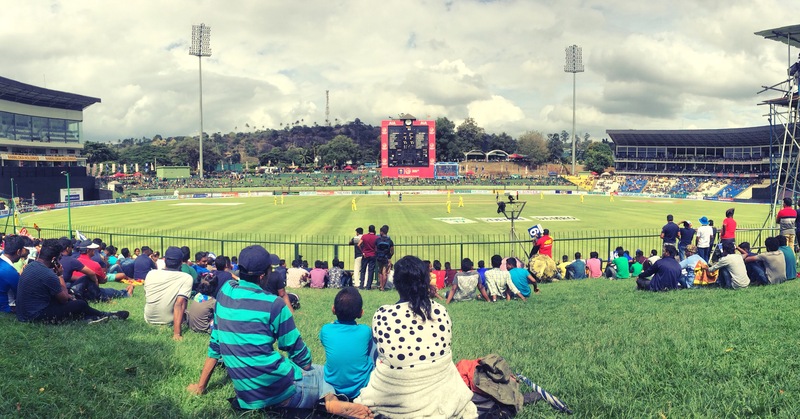 The cricket ground is not in Kandy but in a little town called Pallekele. The bus there took about an hour and only cost 20 rupees. On arrival the atmosphere was already electric. Sitting on a grass embankment in the sun surrounded by locals going wild for their national heroes was a great experience. That night I ate at a cafe called Garden Cafe which is just on the side of the lake. The food came very quickly and again was very tasty. It’s so cheap to eat out all the time rather than cooking in the hostel. The next morning I was up biright and early to try to get a train ticket to Ella. I bought an unreserved ticket for 240 rupees (approx £1.20) and waited for the train to arrive. I bumped into some people I knew from the hostel and we jumped on and sat in the doorway again. I arrived into Colombo airport and the familiar nerves of going through immigration settled in. I don’t know why, but I am always convinced I have done my visa paperwork wrongly and won’t be allowed in. Thankfully the very friendly man stamped my passport and let me go on my way. The next step was to try to find my transfer driver in a sea of faces all frantically waving their name boards at you. I scanned all of the boards and couldn’t see my name, so I headed to the back wall and hung around for a while until it quietened and my options were more limited. It is always a bit daunting when you feel a bit groggy from the flight, arriving into a new country with a different language, and trying to find your feet. Thankfully I met my driver and we went on our way to Colombo City Hostel. He had a very interesting selection of English music ranging from Westlife to Pitbull. The drive took about an hour as the traffic was so heavy. I always forget how wild the roads are in these parts of Asia. Nearly every car was decorated with a bump or a scrape somewhere. The familiar sight of the brightly coloured tuk tuks whizzing in between cars and somehow fitting through the tiniest gaps always amazes me. We made it to the hostel in one piece, just. It’s relatively cheap and it’s basic, about what you can expect from Asia. You get all the essentials but nothing fancy. I checked in and met the famous Sam, the guy who runs the hostel. He’s a great guy, very friendly and full of advice about Sri Lanka. I was shown to my room and had a quick shower before heading up to the rooftop terrace to relax and meet everyone else. Up on the rooftop there was chat of going into Colombo for a few drinks. We headed to a bar called Playtricks which is set up on the grandstand of the old racecourse. The setting was great but the prices were a shock! The beer was the same price as what you would expect to pay at home. The next shock was the struggle I had to find some Sri Lankan food. Everywhere was selling burgers, pizza, pasta but no curry or noodles in sight. After a few drinks in Playtricks we took a tuk tuk to a courtyard bar in the old Dutch hospital. There was a live band and the walls were decorated with fairy lights, setting a great atmosphere. The place was packed! Many locals were there celebrating the end of a working day, with a few tourists dotted in amongst them. After a couple of hours of drinking and dancing I decided to call it a night and head home before my early morning train to Kandy. The hostel provides a free breakfast. It is a traditional Sri Lankan breakfast consisting of rotti, hoppers and a couple of different curries. The food was so tasty, although at 7:30am I wasn’t quite prepared for the spice of the curry! The tuk tuk drivers will occasionally play dumb and pretend they do not know where your destination is. 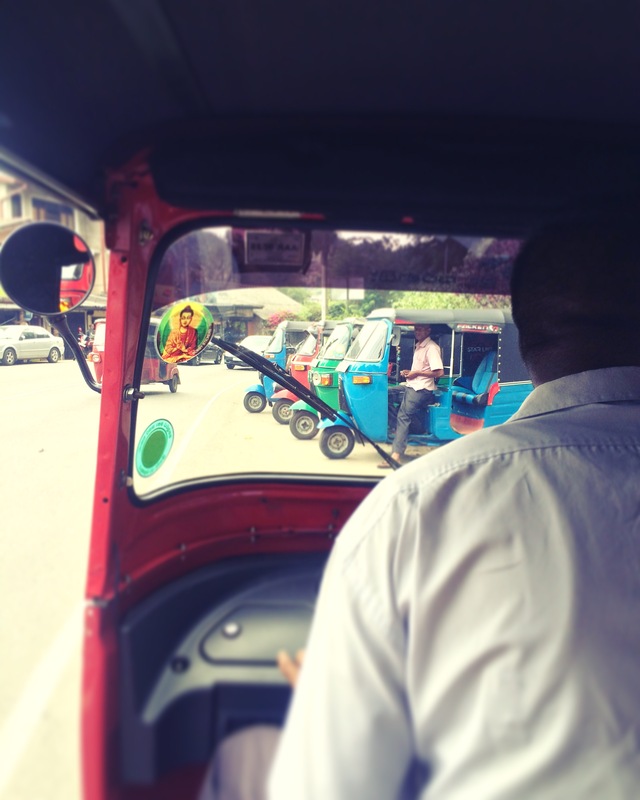 In Colombo the tuk tuks are all metered so the longer you are in there the more you have to pay. Eventually made it to Colombo Fort train station with 7 minutes to get a ticket and find the train. The ticket office was still open and I chose a second class ticket, setting me back a whole 290 rupees (approx £1.50). I managed to squeeze myself on and sat in between carriages where the doors are open, providing you with a kbreeze. It is safe to sit there, but constantly standing up to let people off does get a bit tiresome. 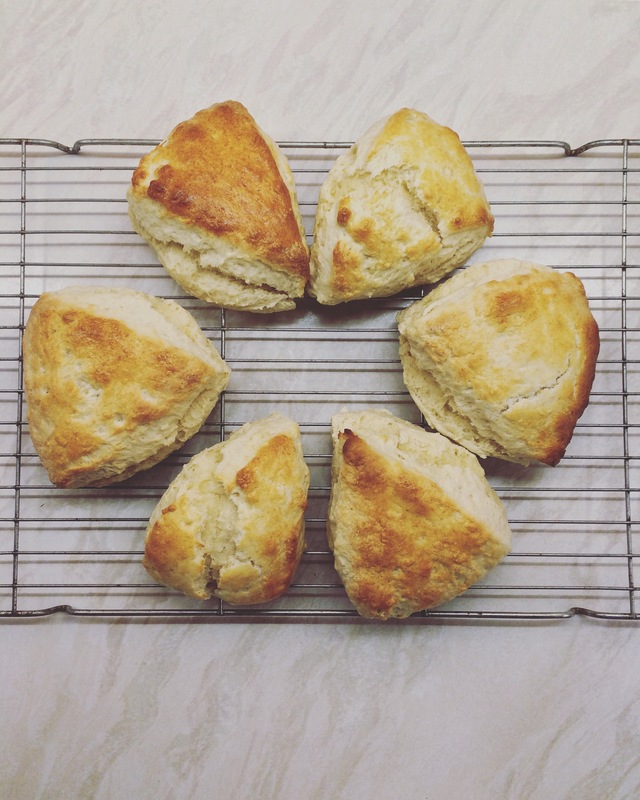 These scones are the absolute dream! They can be on the table in 20 minutes, using store cupboard ingredients. Heat oven to 220c / gas 7. Mix together the flour, salt and baking powder. Add the butter, then rub in with your fingers until the mid looks like fine breadcrumbs. Put the milk into a jug and heat in the microwave for about 30 seconds. Add the vanilla to the milk. Put a baking tray in the oven. Make a well in the dry mix, then add the liquid and combine it with a cutlery knife. It will seem pretty wet at first. Scatter some flour into the work surface and tip the dough out. 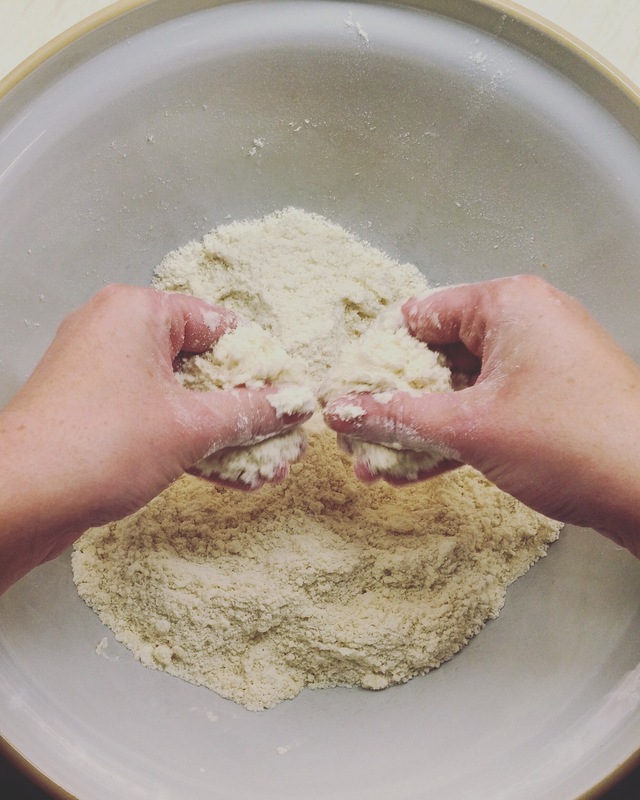 Scatter the dough and your hands with some more flour, then fold the dough over a couple of times until it is smoother. Pat it into a round about 4cm deep. Cut the round into 6 even triangles. Brush the tops of the scones with the beaten egg, then carefully place on to the baking tray. Bake for 12 minutes until risen and golden. I have been making this cake for guests all summer, but yesterday was the first time I tried it as there is usually none left for me! Heat oven to 180C / gas 4. Line 2 x 20cm cake tins. Set aside 1 tbsp of the coffee for the filling. Beat the butter, flour, sugar, baking powder, eggs, vanilla and half of the remaining coffee in a bowl until lump free. Fold in the finely chopped walnuts. Divide the mixture between the cake tins and spread. Scatter the roughly chopped almonds over one of the cakes. Bake for 25-30 minutes, until a skewer comes out clean. Drizzle the plain cake with the remaining coffee. Cool the cakes in the tins. To make the filling, mix together the icing sugar, cream and mascarpone until thickened, then fold in the coffee. 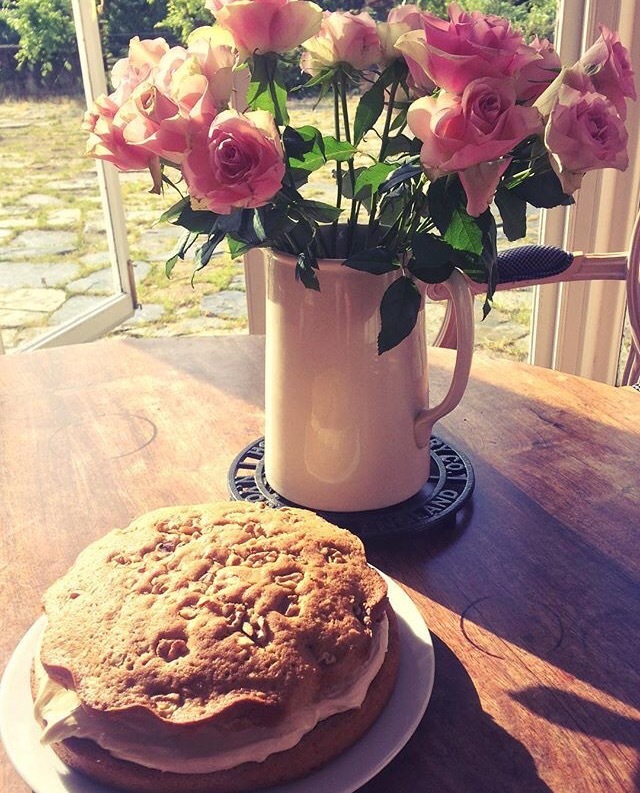 Spread the filling over the plain cake, then top with the walnut topped cake. Just a heads up- working a ski season is a lot of hard work, but also a load of fun, so don’t be put off straight away! First of all, you’ll most likely be exhausted- all the time. For most chalet staff, the day involves an early start to do breakfast service, then heading out on the mountain as soon as work is done to ski for a few hours, before heading back to the chalet to do evening service. You’ll hopefully get plenty of free time, roughly six hours between morning and evening service. How you spend this time is up to you. Most people will ski for a few hours then head back to bed to catch up on some much needed sleep. After evening service, again it’s up to you whether you go out or head home. Most nights you’ll find there is something on in a nearby bar, but sometimes you just have to force yourself to go home for an early night. Although this doesn’t always work out as you will most likely be woken up by your housemates having an after party, or sliding down the stairs on a sledge, or smashing plates and finding it hilarious at 4am… After a month you will be used to feeling exhausted and will become an expert at napping in the afternoon and sleeping through whatever nighttime activities your season friends are up to. You will also most likely get ill, and stay ill. Due to a lack of sleep and poor diet, it’s pretty easy to pick up general colds and flu type things. And once you have it, it’s pretty much impossible to shift it! No matter how many packets of paracetamol and lemsip you pack, it will not be enough. Since doctors and prescriptions are expensive, you only really use them if you really have to. So try and look after yourself whilst still managing to ski and have fun. Your diet is going to go rapidly down hill as soon as you set foot in resort. The temptation of fresh French baguette and leftover chalet cake, every day, is often too hard to resist. You will usually find yourself picking at things for most of the day, but then when it gets to the evening and you realise you haven’t had a proper meal yet, the fear of not making it through service is real and so you decide to eat a whole baguette in one sitting. Those few hours skiing you have done that day will not balance this out and chalet arse can become a big issue. (Top tip:- buy your ski gear in a bigger size to look ‘steezy’ / hide the winter bulk). Drinking is a big part of most people’s ski season. Some people can manage to go out every night, drink copious demis and shots of genepi, and feel fine the next day. Others (like myself) take a more granny style approach and only go large on the night before their day off. Having a big night the night before changeover day is a great idea at the time, as this is usually a Friday and you want to get in the weekend vibe, but having a whole chalet to turn around and still being sick at 6pm is not a great combination. I do not recommend. Most nights out usually involve a lot of spilled drinks, tops being ripped off, and many unidentifiable stains. Don’t take any clothes that you would hate to ruin. The best thing is to go for layers- top, shirt, jacket. As when you are inside it is about a million degrees (dark, dingy bars with no air con are the norm) but walking home is absolutely baltic. Also don’t take any good shoes as these will be trod on all night and will also end up ruined. Nights out on a ski season seem to be completely different to a standard night out at home. Many outrageous antics and questionable decisions are the norm, and you probably won’t even be judged for it. Working in a chalet quickly becomes second nature and you will hopefully have a routine sorted within the first couple of weeks. If you can manage to keep the chalet clean, present good food to your guests and get optimum time on the mountain, then you’ve nailed it. Obviously there will be days when everything goes wrong- you sleep in and have to sprint from your bed to the kitchen in 2 minutes, you burn the cake, you forget to take your meat out of the freezer, the list goes on… But these things happen to everyone, it’s not the end of the world and hopefully there will always be somebody there who has your back and can get you out of any sticky situation. You will live, work, ski and socialise with (mostly) the same people for five months. You’ll get to know all their good and bad habits, you’ll drive each other up the wall, but you’ll go through everything in the season with them and they’ll always look out for you. Your day off is the highlight of the week. The countdown to day off usually starts as soon as you are back to work and recovering from the last one. The night before day off is usually pretty loose as most other chalet staff will also be celebrating not having to go to work the next day. It’s a bit of a catch 22 as it is the only day that you can have a lie in, but also the only day you can catch first lifts and the elusive untouched snow. A healthy mixture of lie ins and first lifts throughout the season is the best way to go. Of course there will be some people who lie in every week, or those who race for first lifts every time, but you will quickly realise how you want to spend your precious time off. Pizza for breakfast is the best way to start the day, no matter what you are doing. And finally the best bit, the skiing! What most people are there for. Whether you’re a seasoned pro or a beginner, most resorts have a great range of pistes, park and off piste for you to shred. It’s always a good day up the mountain, whether it’s a bluebird or if it’s dumping with snow, if you’re on your own or with a squad of friends, there aren’t many places you’d rather be. You’ll get to know the mountain and your favourite pistes pretty quickly, and you’ll have the fastest route to your favourite mountain bar figured out in no time. To buy anything on the mountain is extortionate. Taking a packed lunch up with you and sitting at the top of a mountain really is hard to beat. Alcohol is another major expense, so a bottle or hip flask in your backpack will save you some much needed cents (just don’t fall and smash it). It’s best to buy all your ski gear before you head out as again this will break the bank if you’re going to buy in resort. There are heaps of websites and shops where you can get ski gear for a decent price- Surfdome, Absolute Snow, Oneskee, Ellis Brigham to name a few. Melon, FOMO Eyewear, Sungod, Zaini Hats, Hats for the Hill are some great smaller companies where you can get some fun accessories. (Top tip- if you buy your ski gear in summer it will be way cheaper as it will be last seasons stock). All in all, you’ll hopefully have the best five months of your life, whilst picking up some new skills and making some of the best friends you could ask for. After finishing our ski season in Le Praz, Courchevel, at the end of April, a few of us decided a summer holiday was in order. 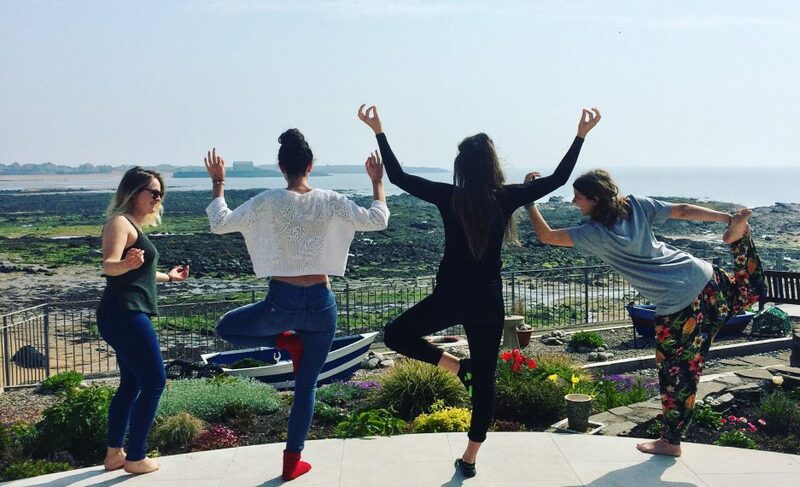 Since one of the girls was going to be spending her summer working in Lanzarote, it seemed the obvious choice. I hadn’t heard much about Lanzarote other than it being called ‘Lanzagrote’. I wasn’t too fussed where we went, a cheap holiday and some sunshine was all I was after. We booked up and the countdown began. 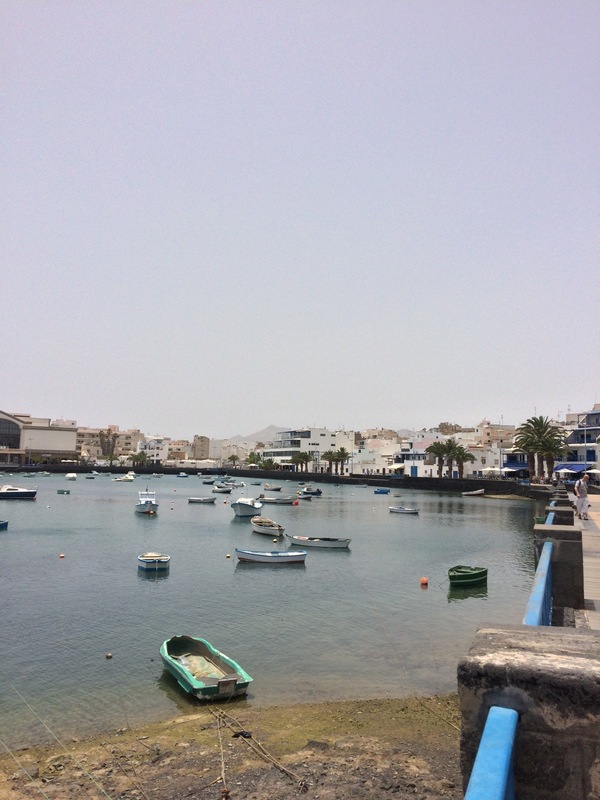 After a few public transport mishaps and a delayed flight, we arrived in Lanzarote and were thankfully picked up by our friends to take us to our apartment. We were staying at Tabaiba Centre Apartments in Costa Teguise. The rooms were very basic, and every morning we would have acquired a new room mate in the shape of a cockroach. Considering how cheap it was we weren’t too bothered and just let them be. The pool area was great and we spent a bit of time chilling out here (or at least trying to anyway, the crazy Spanish children were adamant we would have no quiet time). We found a couple of nice beaches just a five minute drive from our hotel. Although the sea was pretty cold to begin with, it was definitely worth it as the water was crystal clear with fish swimming around you. We tended to stay away from the main busy beaches and would go to the next one along. We spent a day at Los Charcos beach, where there were more cats than people. It seemed to be a popular spot for tourists to learn water sports which kept us entertained. 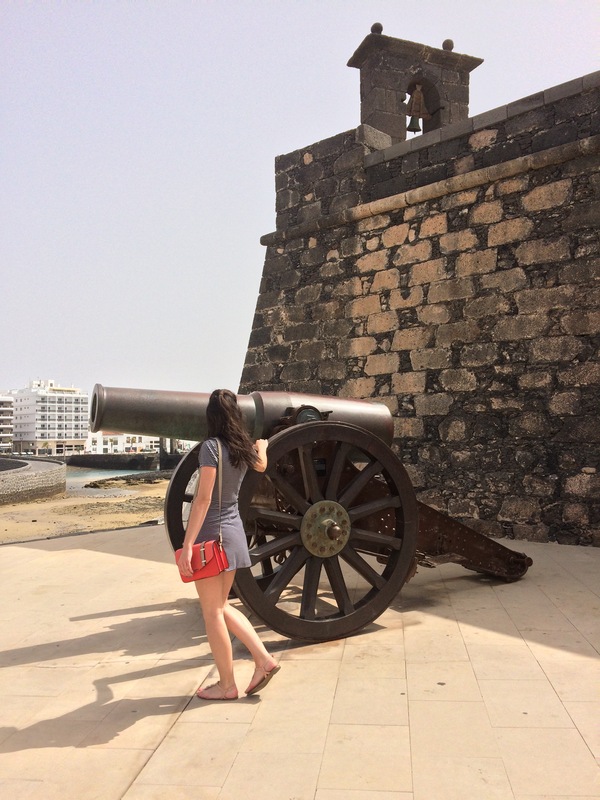 One day we headed into Arrecife to have a look around and try to have a day of culture. On the surface, there doesn’t seem to be much history here, but maybe we were looking in the wrong places. We did come across what looked like a castle but actually turned out to be the history museum, although there didn’t seem to be any more information other than that. We also struggled to find any traditional Spanish restaurants, everything seemed to be directed at tourists. We came across a great Italian just by the harbour, Divina Italia. Everything on the menu sounded great so it was a very tough choice. Very reasonably priced and delicious food. The decor was really quirky and completely different to any other restaurant we had seen. On our last day we went for a drive to Playa Blanca. Straight away we were envious we weren’t staying here, and instead we’re stuck in what felt like a ghetto in comparison. All of the buildings had much more character and it was a much prettier part of the island. 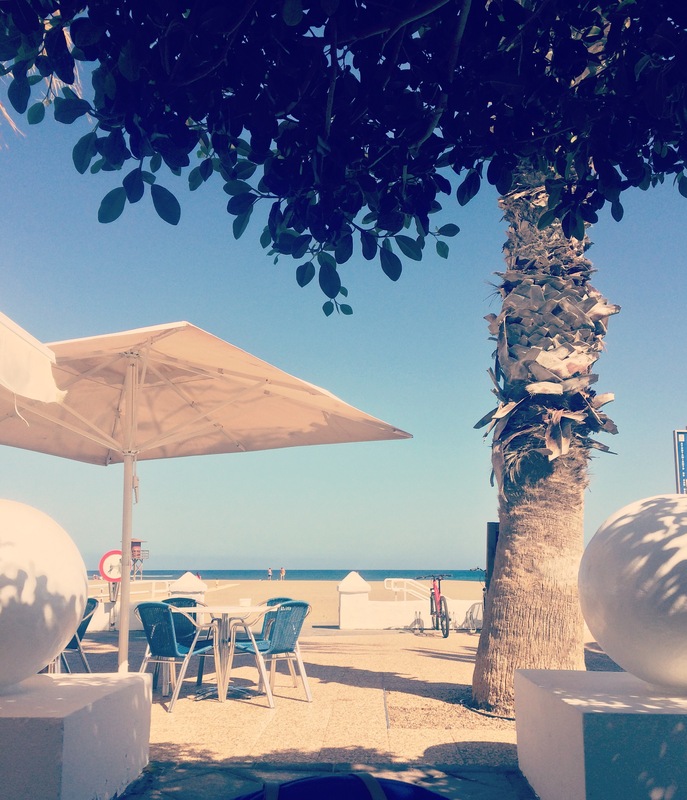 Walking down the promenade and seeing the bright blue sea on one side, and a stretch of restaurants and shops on the other, made us all wish we had came here earlier in the week. We sat in the shade with an ice cream before heading back in the direction of the airport. We stopped off at a restaurant right on Playa Honda beach called Sal Marina. We were welcomed by a lovely little Spanish lady and had a conversation in broken English / Spanish. The food was delicious and again very reasonably priced. The setting was very relaxing, being right on the beach. Driving around Lanzarote you realise how barren the island is. Most of the countryside is brown rocky land with very little vegetation growing. You get the impression that every business is directed at tourists and there are very few traditional restaurants / businesses still there. All in all, it was a fun week with warm weather, swimming in the sea and lots of food. 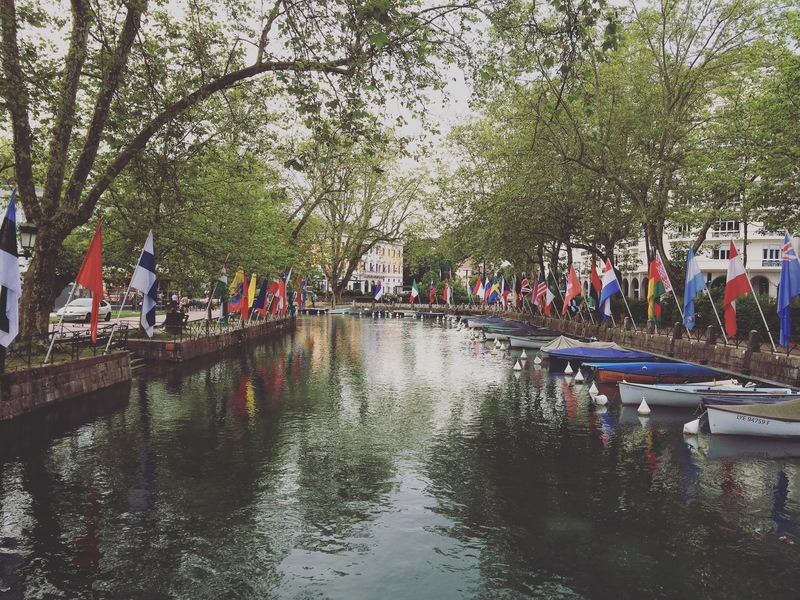 We decided to head for a day trip to Annecy. 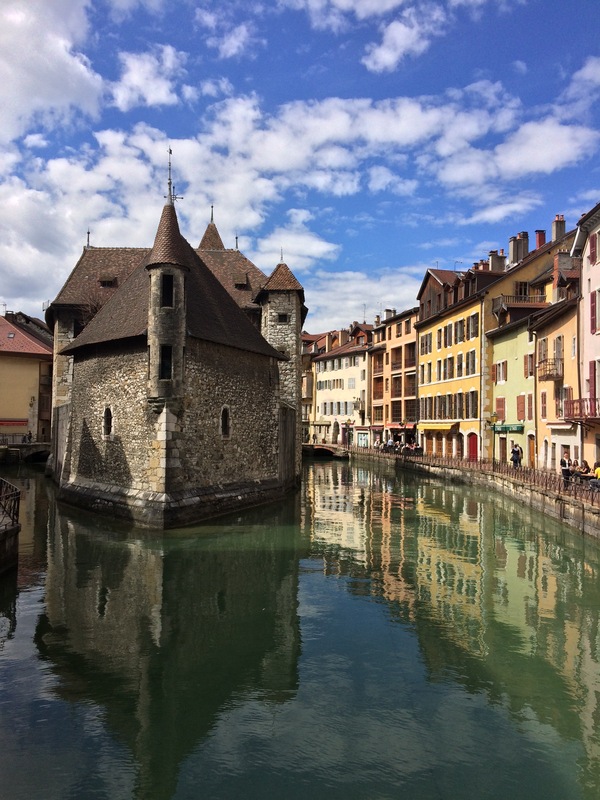 Annecy is an hour and a half north west of us, so it makes a good get away during our ski season when we have been up in the mountains for months. It’s a really pretty city with canals going through the streets, and a lake which you can sail on or cycle round. One of the main reasons for going to Annecy was to donate a bag of clothing which Mollie had brought with her to the refugees who have set up camp in an old school there. We finally found what we assumed was the camp and were met by two women and a man. This was a really bizarre experience as nobody spoke each others language, and to be honest we didn’t really know what to say. They saw the black bin bag draped over my shoulder and took it from me. We tried to explain the bag was filled with clothes, we all smiled at each other, waved and headed off on our way, hoping that we had actually given the clothes to the intended people. 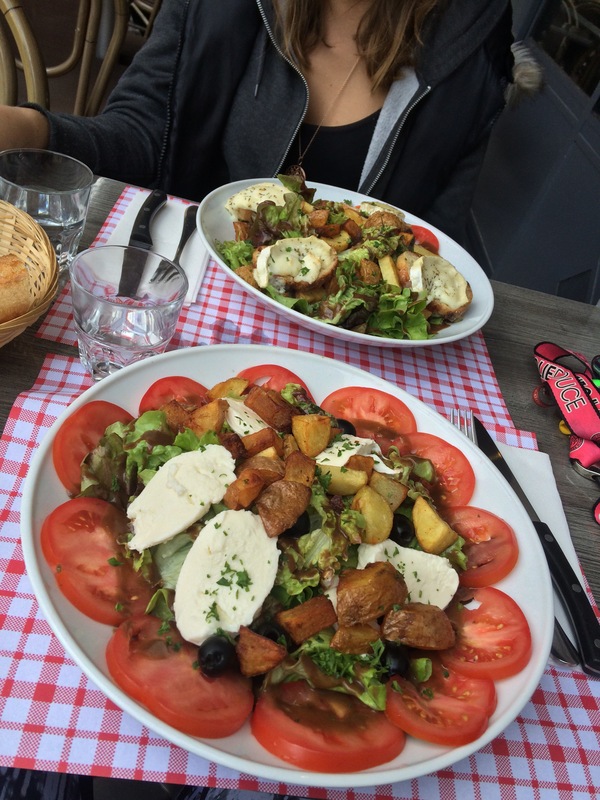 We found a nice cafe called Les Pietons for lunch, and feeling inspired by the great salads yesterday, we all went for salad again. Mollie and Dzifa stuck with the goats cheese salad and I went for the caprese salad. Three huge plates arrived with our salads and once again we were delighted with our choices. Stuffed from a salad- who would have thought! We walked around the town for a while, along the canals and through busy shopping streets. It’s much busier than it was at the beginning of April now it’s tourist season. 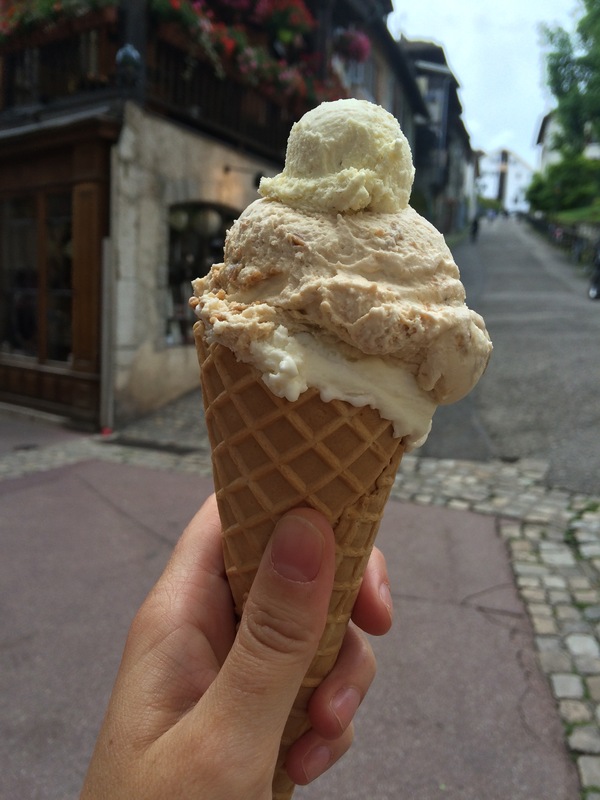 When we were last here we were recommended to go to an ice cream shop called Glacier des Alpes, but we had just finished our meal and couldn’t manage anything else. This time we planned better and left space for ice cream! The shop has a bright yellow canopy so it’s quite easy to find, just off the main restaurant area. So many flavours to choose from, the girl behind the counter was very helpful and managed to explain to us what they were. We ordered two scoops and were lucky enough to receive a free scoop- amazing. After our ice creams we decided to head to the lake to try and burn some of it off. The lake side was really busy with art students painting, families picnicking, roller bladers, cyclists, runners and tourists like us wandering along. 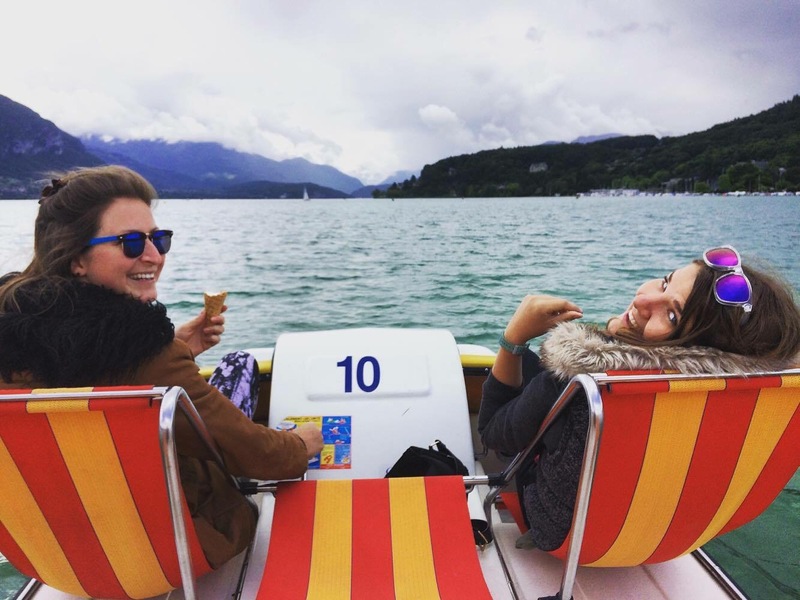 Being the avid explorers that we are, and also quite childish, we were drawn into the pedalos and headed out on to Lake Annecy. What we thought was going to be a pleasant jaunt around the lake taking in the scenery and the wildlife, turned out to be burning thighs, uncomfortable seating, excessive sweating, terrible steering (by me), and a potential storm. We somehow managed to make it back to the dock all in one piece and dry, but with very sore bums. A pedalo is a workout. The building on the left of the photo is the old prison. We headed home to Le Praz and had a quiet night in a local bar. It’s the last supper tonight before I head home to Scotland for a couple of days. Roast beef & Yorkshire puddings! 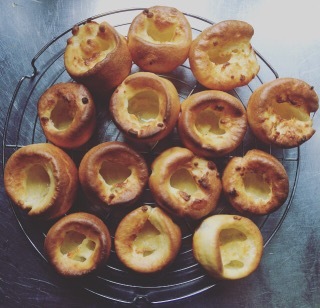 You can’t have a roast beef dinner without Yorkshire puds! More friends have arrived in Le Praz and so more activities have taken place. After a relatively quiet few weeks of walking, these last couple of days have been busy exploring. We decided to head across the mountain to Meribel to try to find some sales and get our new ski gear for this coming winter. The journey there pretty much set the tone for the rest of the day, road closures and a near death incident, we should have headed back to Le Praz. 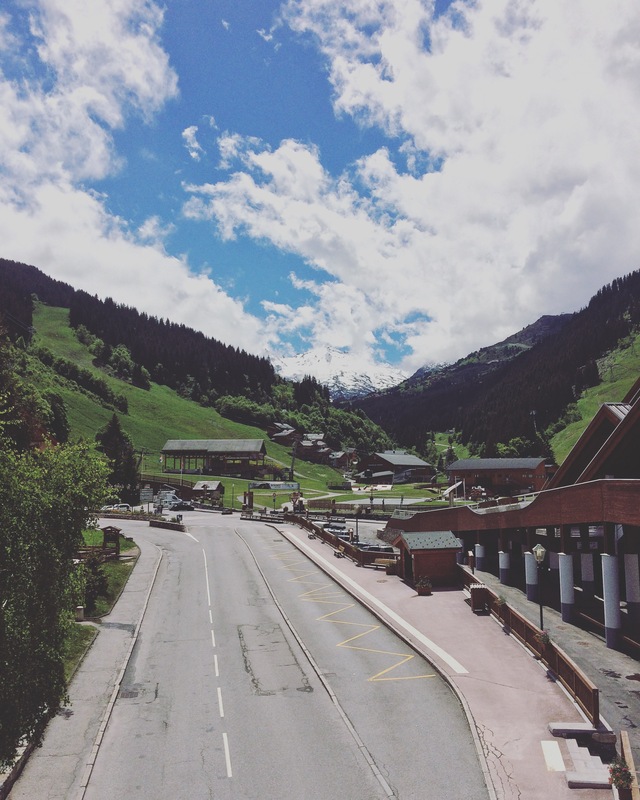 Anyway, we continued on our way to Meribel and arrived to a complete ghost town. No people in sight and absolutely nothing open. We walked up and down the street in the hope that we would find somewhere to eat as Mollie was close to fainting with hunger by this point. No such luck. Being in a ski resort without the normal hustle and bustle that goes with it is really bizarre. Along with the lack of snow and bright green mountains, you really wouldn’t think that two months ago we were skiing there. Still no success to find somewhere to eat, we headed back to where we came from and asked a couple we came across if anywhere was open to eat. They pointed us back in the direction we came from to a restaurant called La Cantine d’Alvar. Since we had no other option, we headed back down the road (we came across a chocolate Labrador puppy which we all wanted to steal) and found the restaurant at the side of what would have been a piste. We didn’t really know what to expect and had no expectations, the fact we found somewhere open was all we needed. The menu was very small – two salads, two burgers and a steak. Chicken burgers and goats cheese salad was the pick of the day and we were all delighted when they arrived. The salads looked really tasty- nice lettuce, apples, walnuts, tomatoes and a big slice of bread with goats cheese which had been toasted. The chicken burgers arrived on a wooden board with a glass dome lid which was very exciting. Luckily everything tasted amazing and there was no food envy from anyone. After a good feed and an unsuccessful shop, we headed back to Le Praz. Since the sun had made an appearance we decided to have a game of tennis. Considering we are all terrible, we played Sophie’s rules. This means 3 a side, the ball is allowed to bounce, and you can help each other to get the ball over the net. After realising just how terrible we are, this soon turned into you are allowed as many bounces as you like and everything is in. It was hilarious, I think we were more tired from laughing at ourselves. Somebody had mentioned the pizza place, The Black Pearl, down in St Bon had opened for the weekend. This is the best place around for pizzas so it was an easy decision to get a take away for our tea. We headed down to pick the food up and got chatting to the man who owns it and also helps prepare the pizzas. He was telling us how he likes to grow a lot of his own herbs and vegetables, and anything he doesn’t buy he sources locally. He let us try some of the ham and it was delicious. It was really interesting talking to him and it was great to hear how enthusiastic he was about his food. The pizzas did not disappoint – can not wait to be back in winter for more. 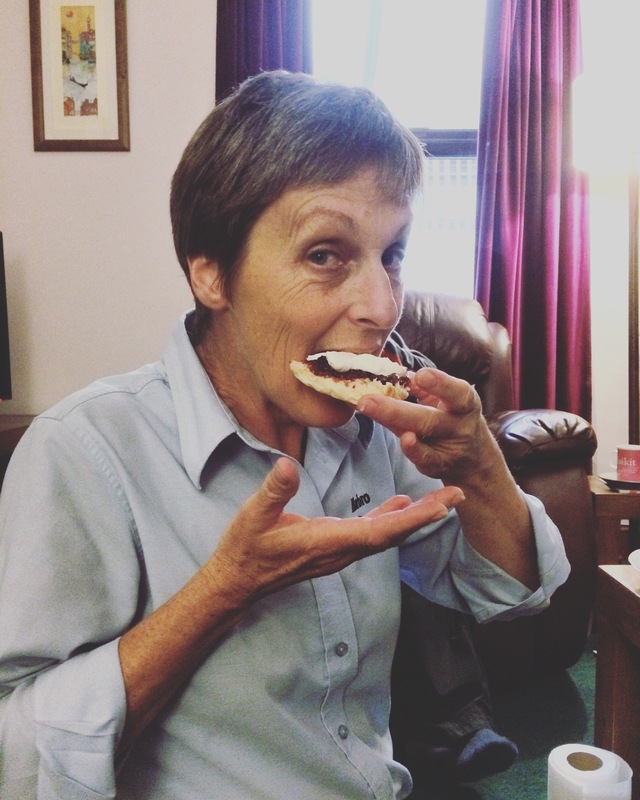 Away to bed – food coma!